I considered the Two Notes Le Clean preamp, which has an actual 12AX7 tube in it; it sounded good on YouTube, but after talking with Sweetwater and thinking about it, I'm pretty sure that it will introduce noise along with all that luscious warm-ness. 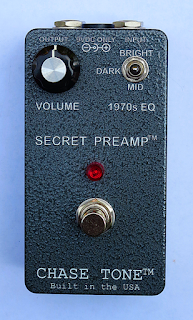 So from DreamPop I found out about the SP (Secret Preamp) and bought one. Here's what I've found. There's debate about where to put the pedal in the chain: beginning-ish, or end. Since it is mono only, I'd need two of them to put it at the end, so I tested in mono thinking that if it really is the secret sauce, I'd gladly buy another for stereo. I tested it in both the end position, and at the beginning-ish of the chain. Basically I was testing for three things: 1) does it introduce noise?..... 2) Does it give me a boost to my signal? ....... 3) Is it really the secret elixir to unbelievably great sound (as the testimonials on the website seem to say)? 1) Noise: At the beginning-ish of the chain, it is very quiet. Can I hear ANY noise at all? Yes, a little. It's like when you held a conch shell to your ears and you were told "it's the sound of the ocean"; that open, hollow, whooshing, deep quietness sound? Yeah, you get some of that; very little. Is it noise? A little, but you have to REALLY listen to hear it, and it's within my acceptable limits. At the end of the chain, when I have a moderate delay and moderate reverb turned on, the noise is un-acceptable to me. There is definite hiss/whoosh/schuss sound. Not OK. I would not use the pedal at the end, which is what is recommended by Kyle Chase. 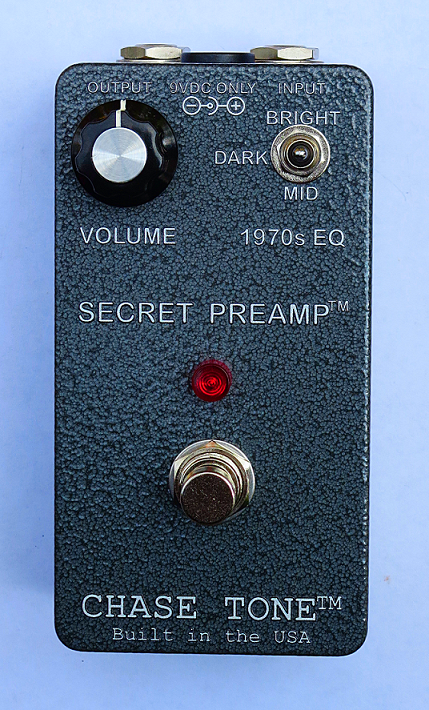 Now for most guys/gals, playing in a band, or playing loud, or playing covers, whatever, I would call this pedal "very quiet". It's not in the same universe as a Tube-Screamer. But for ambient music like I do, and for really quiet sections, I just don't want to introduce ANY noise that I have to fight in the DAW. 2) Does it boost? Yes, quite a bit. As much as I need. It's actually just what I was looking for in that regard. I can't be exact, but using a looper as input and measuring the dry guitar through the SP I seem to get maybe 5 or 6 dB boost, with quietness. Which is fantastic and I'm really digging that. 3) Elixir? Well, the boost alone "makes it sound better". But there is some un-definable "improvement" to the tone. When I flip the SP on and reduce the overall volume simultaneously (to remove the "it's just louder" effect), and compare it with the dry signal, there is an open-ness, a fuller sound, a "bigger" sound, a bigger field of sound... I can't describe it. Is it unbelievable? No, not at all. Could my wife hear the difference? Probably not. Is it, alone, worth the price of the pedal? Probably not. But it's nice. And having the bright/mid/dark switch is a nice easy way to mod the tone quickly. Overall, the pedal is a keeper. It'll be an "always on" type of thing, and it will let me get the signal strength I want, cleanly, without always fussing with my OB.1 and Strymon Sunset, and fighting the noise from it when I get too pushy. And the price, $160 shipped, is really attractive. Nice work to Kyle Chase and thanks to DreamPop for turning me on to it. Update: 3/17/2018.... After use, I was dissatisfied with the noise. Talked to Kyle. After experimenting and good sleuthing on Kyle's part, it turns out that the power supply, (from a Strymon Dig), was causing an impedance mismatch. I swapped to a different clean power supply and the noise is gone.